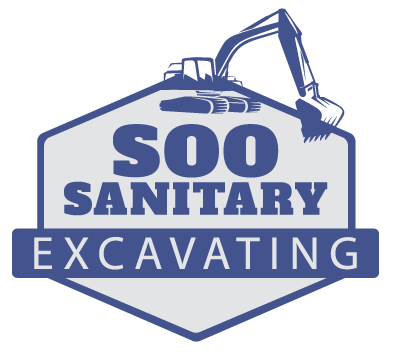 Excavation is elevated to an art form when performed the by professionals at Soo Sanitary Trenching and Excavating. We’ve been completing earthwork projects in the Brandon area since 1984, and are now the region’s premier dirt-moving contractor. We complete all projects, large or small, commercial or residential, with top-of-the-line equipment run by experienced handlers, leaving as little environmental impact as possible, while employing superior customer service. We meet deadlines because you have deadlines to meet. Solid construction begins with professional dirt handling. Excavation is the key to everything from proper water drainage and erosion control, to a level foundation and attractive landscaping. It’s our mission to so expertly prepare your worksite that construction delays and post-construction issues due to site mismanagement are a thing of the past. Site Prep: Grading, Tree Removal, Demolition, etc. We don’t think much about sewers until we’re forced to. Soo Sanitary is equipped to address all of your sewer system needs. With over 30 years of experience, we are the go-to for residential and commercial sewer line service. We can expertly diagnose and pinpoint the exact location of sewer system malfunctions, eliminating unnecessary digging, and ultimately saving us time and you money. From farm to home to business, water is crucial to life. It’s when we cannot use the water in our homes and businesses that we realize how critical it is to a functional world! At Soo Sanitary, we are the water line installation and repair experts. Whether you require trenching or vibratory plowing and boring services, expect that Soo Sanitary will get the job done on time and on budget, with exceptional workmanship and customer service. Boring or horizontal directional drilling allows underground work to be done where trenching is not possible or practical. This trenchless system installs underground facilities without disrupting traffic flow, compromising existing landmarks, or negatively impacting the environment.